It's fantastic at cleaning, leaves every plate and glass dry and sparkling and rivals models costing hundreds more. Looking to upgrade your dishwasher at the Easter weekend sales? We’ve just reviewed the latest popular models from Beko, Bosch, Indesit, Hoover and Whirlpool – ranging in price from less than £250 to more than £700. We’ve also just tested a couple of Hisense dishwashers as the brand, more commonly known for its TVs, has just branched out into making dishwashers for the UK market. 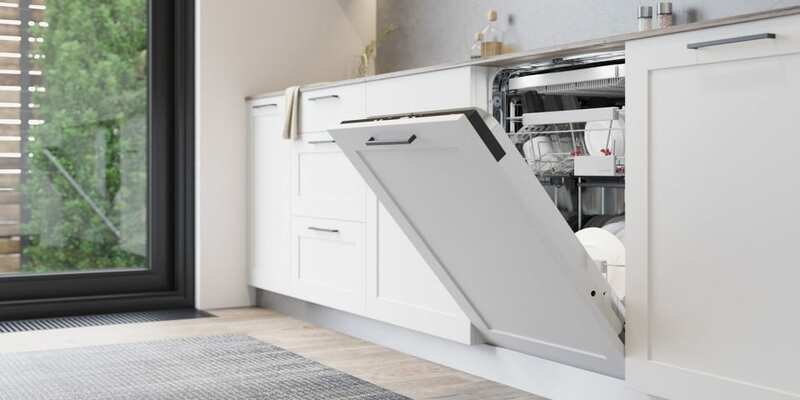 Out of the 10 dishwashers we’ve just put through their paces in time for Easter shopping, three really impressed us, including one of the best dishwashers we’ve ever tested – scoring an impressive 82%. What makes the best dishwasher? The difference between a good and bad dishwasher could save you time (washing dirty dishes over again and having to hand dry them) and money. It could even help the environment by using less energy and water. The best dishwashers we’ve found will blast away all but the toughest of grime, while the worst will even struggle with tea stains, and leave almost a quarter of your crockery and pans dirty. The top Best Buy we found could save you more than £13 a year on energy bills. 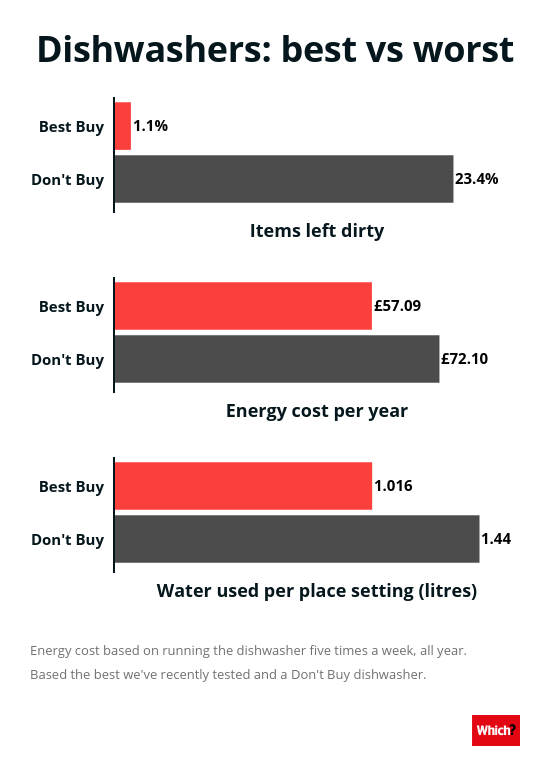 The most efficient dishwasher we’ve ever found costs just £43 a year to run – saving you almost £30. If you only put your dishwasher on when it’s full, the best will use less water than a washing up bowl, despite cleaning more than a hundred items. We’ve also praised its efficient auto and eco programs, clear and simple to use controls. 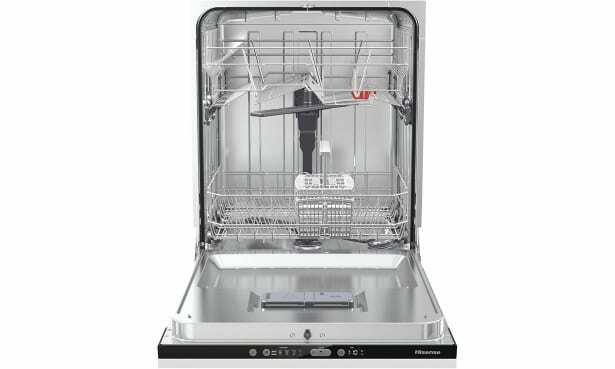 It’s easier to use than most dishwashers and rivals models that cost hundreds more. It’s an integrated dishwasher, which means it’s built-in to your kitchen cabinets. Find out how it compares in our integrated dishwasher reviews. Hisense is a name you might not have heard before, at least in the kitchen. 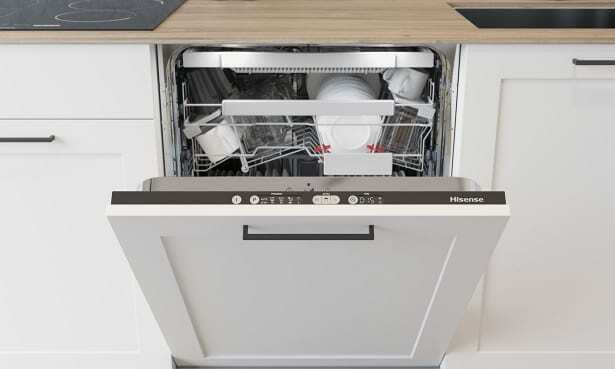 It’s recently released its first dishwashers available in the UK and we’ve tested two. The Hisense HV6131UK sounds impressive on paper, particularly for £439. It has 16 place settings (the joint-highest we’ve seen), an A+++ energy rating (the highest you can get), and an auto open door feature to help with drying (something normally only seen on high-end machines). We’ve sometimes found that dishwashers with 16 place settings try to squeeze in too many items. Read our Hisense HV6131UK review to find out if it can buck this trend, and still get your dishes and glasses to sparkle. The Hisense HV6120UK has the auto open door feature seen on many Miele dishwashers. But it costs half of some Miele models – at £429. Auto open means the door of the dishwasher cracks open just a fraction at the end of the program. This should help get every item dry, and allow the dishwasher to use less energy. Read our Hisense HV6120UK review to find out if this dishwasher will help you save on your bills. If you don’t fancy any of the dishwashers we’ve detailed above, follow the links below to check out the other models we’ve recently tested. Prices correct as of 16 April 2019.